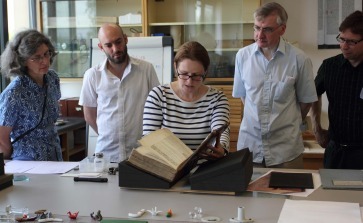 Today we were delighted to welcome great friends of Sprint for Shakespeare to the Bodleian’s Conservation Workshop. 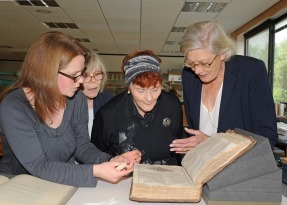 Vanessa Redgrave, Thelma Holt and Margo Annett visited the First Folio in its temporary home, accompanied by Richard Ovenden, Associate Director of the Bodleian. 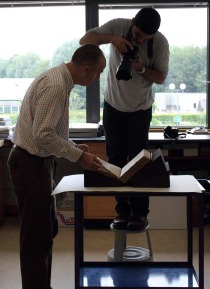 Nicole Gilroy and the team of conservators, Arthur Green, Andrew Honey, and Julie Sommerfeldt, explained details of the book’s history, and the work they are carrying out. What, my dear Lady Disdain! are you yet living? Jeremy Stern conducted interviews with Richard Ovenden and Vanessa Redgrave: if you are local to the Oxford area, watch the 6.30 news on BBC1 tonight to see more! 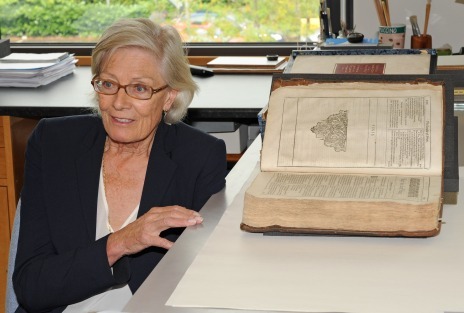 We’re enormously grateful to Vanessa Redgrave and Thelma Holt for all the support they are lending our campaign. 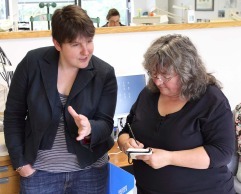 It was a joy to be able to show them and our other guests our work underway. Much Ado About Nothing opens at the Bodleian on 7 August 2012, before going on tour to Stratford-upon-Avon (The Dell), London (Southwark Playhouse), Guildford (Mill Studio, Yvonne Arnaud Theatre), and Tokyo (Saitama Arts Theatre). Tickets for the Oxford run are available from the Oxford Playhouse.